I’m still working on achieving success. But while I put my plan into action, I can share what I’ve discovered through the course of observing those that have become successful. It seems that no matter what you’re trying to succeed at, be it writing or another pursuit, they all have some elements in common. And they all start with P.
When I was a young kid, I wanted nothing more then to play the violin. My neighbor, and then best friend, played. We were five and I was jealous. I begged and begged, and finally, when I was in fourth grade and it was offered through the school, I was allowed to join orchestra. I stood in front of the class to play Twinkle Twinkle Little Star, and dropped my violin, breaking it into pieces. I survived to play another day, but it did take a few weeks to get the thing back. By sixth grade, I was able to play Disney songs and was working on vibrato. I was decent. How? I had good habits. My mom made me practice that stringed demon an hour every day. I’ve known a few people to actually make it in Hollywood. I turn on the TV and I see their faces and it’s weird, and honestly, it kind of ruins the shows for me. But it’s also neat to see them succeed. And I know they got there because they worked at it. They practiced. They did things they didn’t get paid for to hone their skills, build their resumes, to get experience. I’m trying to be a professional writer. An author. So, I write. A lot. Writing is an art. And like any art, it gets better with practice. A couple years ago, for no real reason other than a whim, I wrote my first novel, Nightfall. While I’m proud of it being the first novel I wrote, to be honest, it is probably awful. Otherworlders came next. I think it’s good. But it’s definitely different. It’s only been a year since I wrote it. But I just finished a polish on it, and I notice a huge difference in my style. I still believe in Otherworlders, but I like what I’m doing now a lot better. I’ve gotten better. As much as I grew to enjoy being able to make music, by then I was over it. It hurt my arm. It bored me. I stopped playing it. I dropped out of orchestra. I’ve picked up a violin since then, for funzies, and found I can only kind of play a screechy version of that first song. I can’t read music any more. Last I heard, my former friend was touring the world playing her violin. I tried to be a photographer for a while. I loved it. But I didn’t have enough passion to turn it into a career. Before long, what had excited me felt like a chore. Eventually, I didn’t feel like trying to make money off of it, and I was, was worth doing. Here in Hollywood, there are many who say they want things. Claim to be things. An actor, a singer, a writer. But they’re not. They’re hobbyist, trying to feel better. Why? Because, while they may like or even love it, they just don’t love it enough. Instead, they complain. They procrastinate. They feel personally insulted that fame doesn’t hunt them down and hand them a golden pass for doing nothing other than their day job. Actors may have to move to strange locations for months or years on end, work all day long, all night long, they have people telling them where to go when, what to say and not say, dressing them… you lose a lot of freedom. Most successful writers say that you must write every day. It doesn’t matter if it’s even good. Do it. Doesn’t matter if your tired. Busy? Make time. If you love it, you’ll do it. 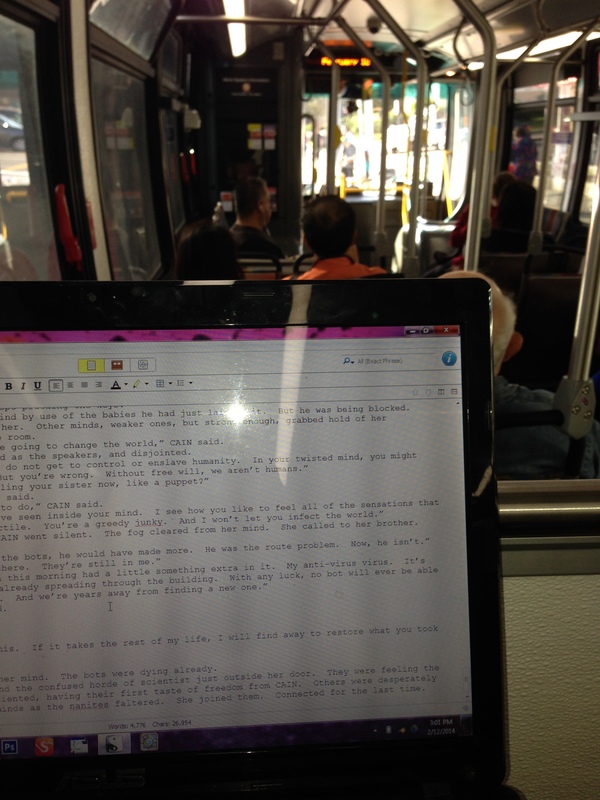 Write on the bus. Got to work? Write in the morning, or into the night. Being successful is demanding, and you have to be willing to give your all for it. And if you are, then you’ll make it. It won’t happen over night. There is no timeline. No finish line. And likely, there is a lot of heart ache along the way. I literally just now, in the midst of writing in the post, got an email from Lightspeed Magazine rejecting a story I submitted. And it hurts. I thought it was really good. And who knows, maybe it was, but just not what they needed? But I have to keep going. I’ll submit it elsewhere. I have yet to hear of any writer that didn’t get rejected at some point. Stephen King used to keep his rejections pinned to a wall. J.K. Rowlings had Harry Potter rejected by dozens of publishers. John Grishman got told no, too. But they kept going. Kept pushing forward, and wouldn’t accept no for an answer. They likely felt like quitting a million times, thought about having their day job be their only job. There were likely nights when they were too tired to write, but they did it anyway. They stared rejection in the face and said give me more if you have to, cause some day I’ll get a yes. And they did. No matter how long it takes, success comes with those Passionate P sisters. Keep on writing, and I will continue to do the same. See you around the blog neighborhood.